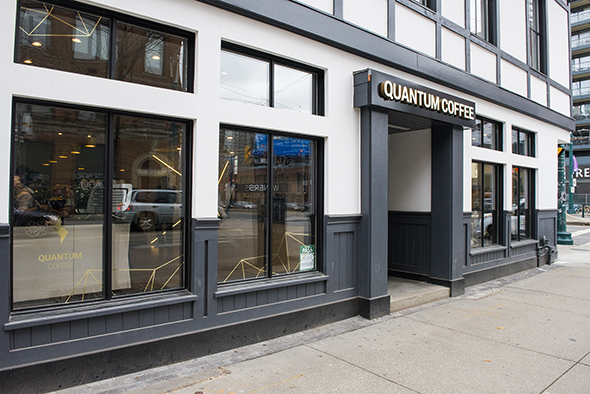 Quantum Coffee opened inside the newly restored heritage building at 460 King Street West - you may remember the space as being home to Global Village Backpackers, or else as the Richardson House, the Hotel Falconer, the Spadina House or the Hotel Spadina before it. Clearly it has a storied past. Thankfully it wasn't demolished to make way for a glass tower. 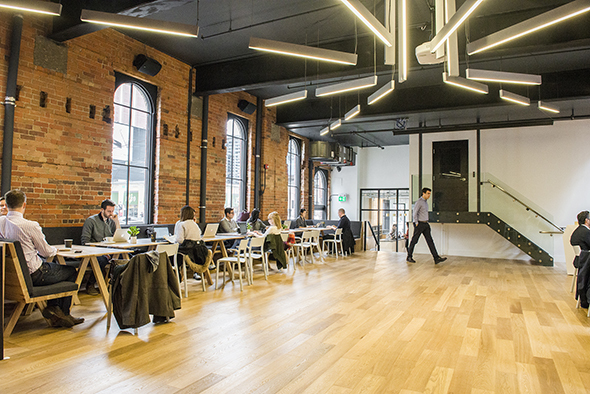 Rather, the Konrad Group moved into this Allied Properties REIT-owned building and restored it with the help of Reflect Architecture and Maast . Located at street level, Quantum is bright and airy. The minimalist space features synapse-inspired design elements that continue throughout the four-storey building. 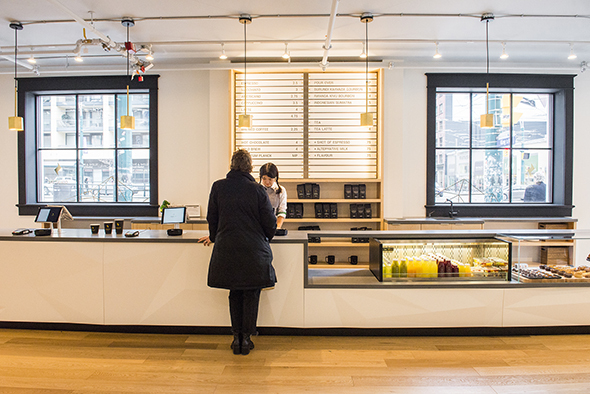 Instead of lining up and then processing down the bar to pick up a coffee, you order on one side of the room and pick up your beverage on the other. General Manager Max Waters (formerly of Hank's and Jimmy's Coffee ) uses an automated Pour Steady machine , the only one in Canada, to serve up perfectly calibrated pour-overs ($4-$5) - all made with Classic Gourmet beans - quickly and to scale. My latte ($4) comes jazzed up with latte art thanks to supervisor Iain Soder. I also try the Quantum Planck, a food-and-beverage feature that'll change seasonally. For winter, Quantum tops a wooden board (hence the name) with a creme brulee cappuccino and a delicate dark chocolate mendiant. 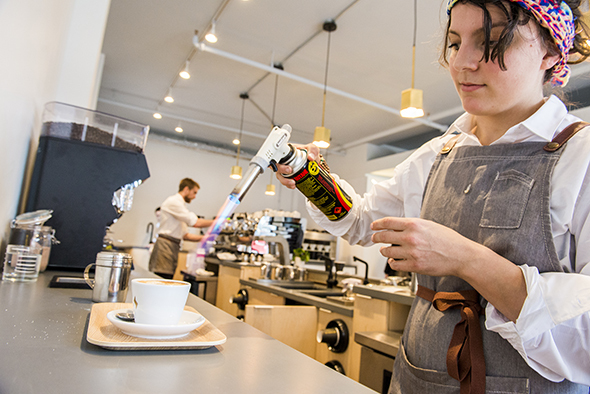 A barista carefully caramelizes the frothy beverage with a blow torch. Just like the classic French dessert, I need to break into it before I take a sip. 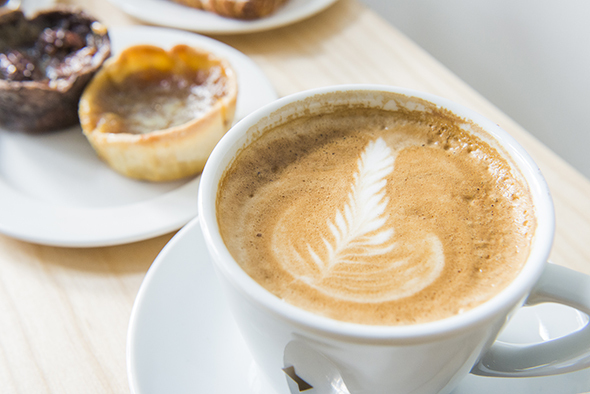 For non-coffee drinkers there are tea lattes ($4), including one with blueberry tea and vanilla, as well as hot chocolate. 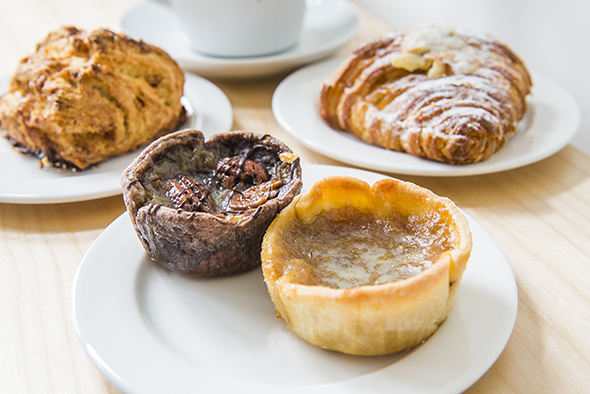 There's also a pastry case filled with treats, such as croissants from Bertrand AlĂŠpĂŠe ( The Tempered Room ), Baker & Scone scones and butter tarts from Leah's Bakery . There are only a few seats in the actual cafe, however, if you walk towards the back you'll notice a spacious room filled with tables and chair. This area is open to the public during the day; at night it becomes an event space. 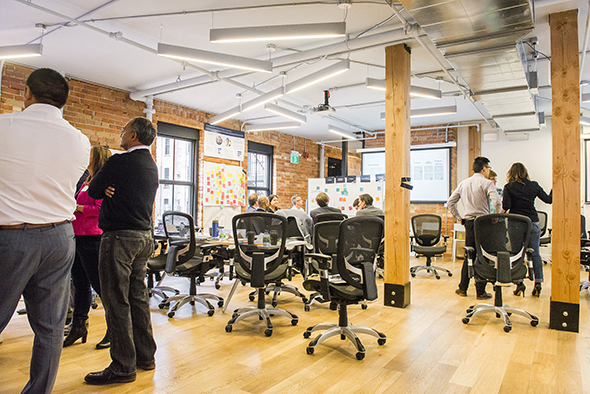 BrainStation , which Konrad Group acquired, occupies the rest of the building. It holds its various course and workshops on the upper floors. As I walk up the narrow wooden stairs, I can almost imagine the building as a hostel. Though no longer filled with rowdy, young travelers, it's still a hub of (quieter) activity.